FINRA reviews firms' approaches to cybersecurity risk management, including: technology governance, system change management, risk assessments, technical controls, incident response, vendor management, data loss prevention, and staff training. Use of this checklist does not create a "safe harbor" with respect to FINRA rules, federal or state securities laws, or other applicable federal or state regulatory requirements. Report on Selected Cybersecurity Practices – 2018 is a detailed review of effective information-security controls at securities firms. The report is designed to help broker-dealers – including small firms – further develop their cybersecurity programs. The report addresses areas that firms tend to find most challenging: cybersecurity controls in branch offices; methods of limiting phishing attacks; identifying and mitigating insider threats; elements of a strong penetration-testing program; and establishing and maintaining controls on mobile devices. Report on Cybersecurity Practices (2015) highlights effective practices that firms should consider to strengthen their cybersecurity programs. The observations and practices in the report are based on a variety of sources, including a sweep we conducted in 2014 of firms of varying sizes and business models, a 2011 survey of firms and interviews with other organizations involved in cybersecurity. As we note in the report, there is no one-size-fits-all approach to a cybersecurity infrastructure. Rather, the risk management-based approach that we discuss in the report enables firms to tailor their program to their particular circumstances. Firms should get to know their local Federal Bureau of Investigation (FBI) and proactively plan for a cybersecurity attack or breach. In an effort to provide enhanced compliance tools and resources, FINRA has developed the Compliance Vendor Directory (CVD). The FINRA CVD is designed to give firms more options in locating vendors that provide compliance-related offerings, including cybersecurity vendors and services. Use of any products, services and/or materials offered by these vendors does not ensure compliance with regulatory requirements or create a safe harbor from regulatory responsibility. Firms should undertake their own assessments to determine whether the products or services meet their technology and security requirements. FINRA does not endorse these vendors or products, services or materials they offer and firms are not obligated to use them. Use of any of these resources does not ensure compliance with FINRA's cybersecurity rules and policies. FINRA does not endorse or guarantee any of the resources listed within. The Securities Exchange Act of 1933 (17 CFR §240.17a-4(f)) requires firms to preserve electronically stored records in a non-rewriteable, non-erasable format. In an era when much of our lives happen online, cybersecurity is more important than ever. But what do you do to protect your personal information? We all have a role to play in keeping ourselves secure. This National Cybersecurity Awareness Month, tune in to learn more about how you can keep yourself, your family and your clients safe online. From banking and investing to social media and shopping, the internet is an essential part of our daily lives. That means cybersecurity is more important than ever. That is particularly true for FINRA, which can process up to 99 billion records in a single day. Here, John Brady explains how FINRA stays cyber secure. Cybersecurity experts and regulators gathered in New York City on February 22, 2018 to focus on key ways the financial services industry can maintain cybersecurity. Use of any of these resources does not ensure compliance with FINRA’s cybersecurity rules and policies. FINRA does not endorse or guarantee any of the resources listed below. FINRA has created a checklist to assist small firms in establishing a cybersecurity program. This one-hour free webinar tackles a top priority for small firms: building an effective cybersecurity program with limited resources. The Report on Cybersecurity Practices focuses on the types of threats firms face, areas of vulnerabilities in their systems and firms' approaches to managing these threats. FINRA is conducting an assessment of firms’ approaches to managing cyber-security threats. FINRA is conducting this assessment in light of the critical role information technology (IT) plays in the securities industry, the increasing threat to firms’ IT systems from a variety of sources, and the potential harm to investors, firms, and the financial system as a whole that these threats pose. During this free, 45-minute webinar, panelists discuss top cybersecurity threats facing broker-dealer firms and how firms can protect themselves from these threats. FINRA is updating this Alert to tell you about some of the latest online identify theft scams targeting financial sector customers and to provide tips for spotting and avoiding these scams. These days, so much of our lives happen online. That makes cybersecurity more important than ever before. This National Cybersecurity Awareness Month, we’ve got five tips to help to stay safer and more secure online. Information technology (IT) plays a critical role in the securities industry. Unfortunately, cyber threats to the information and computer systems of brokerage firms are increasing, and with these threats comes the risk of potential harm to investors. FINRA has received an increasing number of reports involving investor funds being stolen by fraudsters who first gain access to the investor’s email account and then email instructions to the firm to transfer money out of the brokerage account. In addition to issuing a Regulatory Notice to firms, we are issuing this Alert to warn investors about the potential financial consequences of a compromised email account and to provide tips for safeguarding your assets. Computer security experts point out that economic cyber-crime continues to surge. Phishing attacks have increased significantly since they were first discovered in 2005. These scams typically use bogus emails to lure you into giving the scammers your personal information. But you can arm yourself with knowledge. We have three tips to help protect you from cyber criminals looking to steal your money. Your brokerage firm has an obligation to safeguard your personal financial information. And every investor should take time to understand their firm’s cybersecurity procedures. But even the best procedures cannot prevent all instances of identity theft—especially if the vulnerability lies with you, the customer. Here are critical steps you can take to safeguard your financial accounts and help prevent identity theft. Use this checklist to safeguard your sensitive information and help keep identity thieves at bay. Cybersecurity experts and regulators gathered in New York City on February 22, 2018 to focus on key ways the financial services industry can maintain cybersecurity. 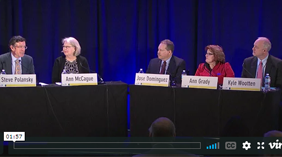 Check out some of the things discussed in this recap of FINRA's Cybersecurity Conference.